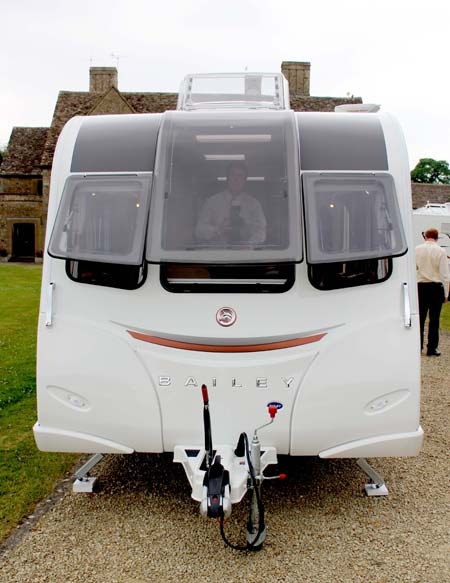 Bailey of Bristol launches all new 2014 Bailey Unicorn! 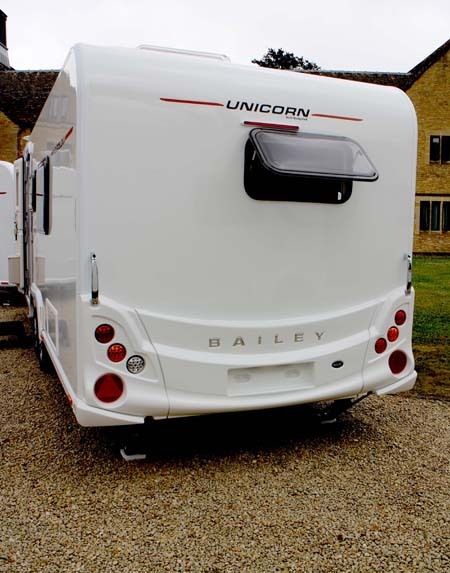 The third generation of Bailey Unicorn caravans will be arriving at Bailey retailers towards the end of August, but a scoop of journalists had the pleasure of viewing the eight model line-up in mid-July. Would there be many changes to the very successful second generation? Surely just a simple make-over was necessary? How wrong we were. The first changes to be seen were the introduction of a polar white GRP outer skin, flush-fit impact resistant front and rear bumpers plus new graphics. Then we noted a roof mounted 100 watt solar panel and the external BBQ point on the offside. All models feature a new AL-KO one piece galvanised steel chassis, braking and running gear, AL-KO ATC trailer control, AL-KO AKS 3004 stabiliser, AL-KO shock absorbers, and a new TRACKER Retrieve. Also included are WSL laser balanced alloy wheels and anti-tamper WSL safety bolts. Single axle models have an AL-KO Secure portable wheel lock whilst the three twin-axle models have two. When insuring a new Unicorn caravan, owners will be pleased to learn that the standard fit TRACKER Retrieve system, the AL-KO Secure wheel lock and AL-KO ATC will qualify for sizeable premiums savings. 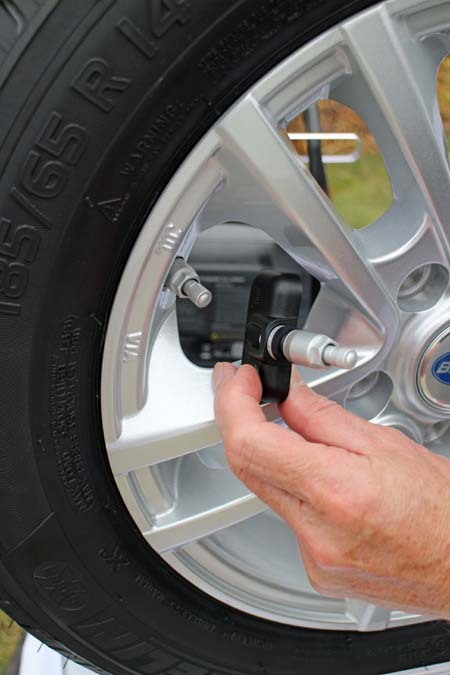 A first in caravan manufacturing is that each new Unicorn caravan comes with factory fitted internal sensors in the wheels, TyrePalTPMS Ready tyre pressure monitoring system. 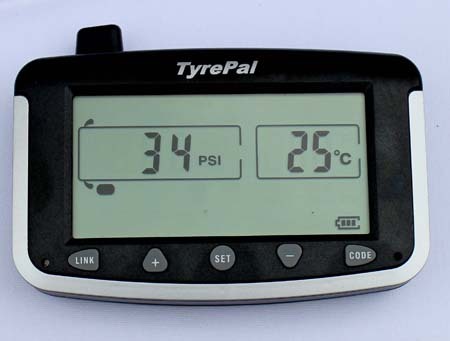 The owner can buy the monitor which will display the pressure and temperature of tyres on a continuous basis whilst driving and gives an audible warning in the event of air loss, high or low pressure or high temperature. On the inside, the leisure battery locker has been moved and it now centrally located under the floor, with easy access. A new Alde Hydronic Compact 3020 radiator and water heating system with a touch screen user friendly control panel is complemented by a new panel radiator in the bathrooms. Angled backrests and seat ventilation boards have been added to improve the air flow and thus improve the efficiency of the heating system. Shower tray size has been increased by 25%, bathrooms are marginally increased in size and up to 15% increase in floor space has been achieved in the living and bedroom areas. Kitchens have benefited from Bailey’s radical design overview with up to 10% more worktop space, largely thanks to a drop-down worktop extension and a reduction in the size of the sink, which is now circular in shape. 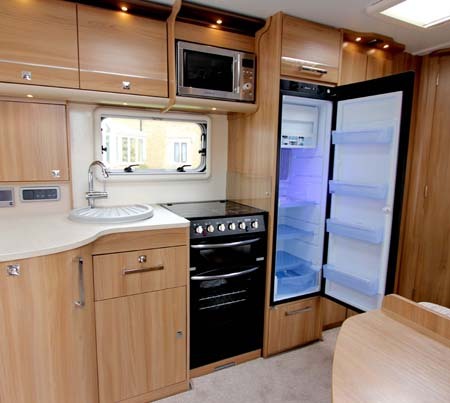 A very notable feature is the new Dometic 133 litre tower refrigerator in the single axle models, with shelves that do extend to the back wall of the fridge; the fridge is exclusive to Bailey and will make a welcome change for those who are fed-up with having to kneel on the floor to load the fridge or to reach the bacon that has slipped down the back of a shelf. Twin axle models retain the Dometic 190 litre fridge-freezer. There are two soft furnishing schemes; unsurprisingly Kensington, the standard colour scheme, has lavender and heliotrope as contrasts which gives a contemporary look whilst the optional Trafalgar, is a little more conservative but both harmonise well with the Mendip Ash furniture finish. Drop-in carpets are now a heavier duty than in previous models and the vinyl floor covering is more robust than ever. A new faux leather surround has been fitted around the vertical skylight and has integral ambient and task lighting. And so with these changes we expected a price hike; again an incorrect assumption as prices have only been increased by a staggering 0.6% which averages at £142 per model. The concerns relating to the circular shower enclosure see to me misinformed as the unicorn S3 has gone back to square shower of the same size as in the s1. We have Valencia S1 and have used it lots. Great van and was very impressed with the new s3 and have just ordered an S3 cartagena, one of the factors being the change back to the square shower and the lovely neutral interior that will not get dated very quickly. Roll on november! We have a bailey ranger gt60 2010 and would like to upgrade but have lost faith in bailey a bit. We brought our caravan from the Birmingham show it’s our first caravan so was told by the bailey dealers you can go to any bailey dealership for services. So we brought our first caravan from a dealer up north. Anything was great until last year had it serviced found the top split and very damp. We had to wait 13 months to get it in the workshop and they still have it after 7 weeks and no date to pick up. Bailey have not been very helpful but we love the new bailey but l don’t like that you can only email bailey do you think there customer service is going to in provide as they have not been helpful at all. Sorry to hear that you’re experiencing problems with your Bailey. The only thing we’re able to do is direct you to Bailey’s customer service team which can be reached on customerservices@baileyofbristol.co.uk. Apologies I can’t be of more assistance. 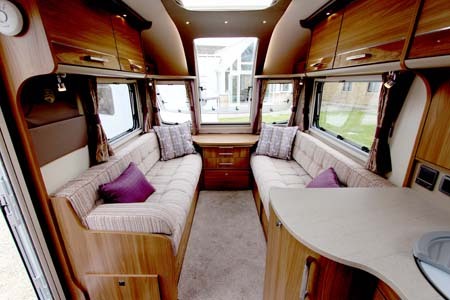 we have a bailey seville 2010-11 which im really pleased with although were hoping to upgrade later this year .the trouble is is the more you search the more conflicting views you find ;( not sure which way to go . Having had 2 Baileys, a Senator Wyoming 2003, and a Virginia 2008, we have justed ordered a unicorn Vigo S3 due End Feb 2015. 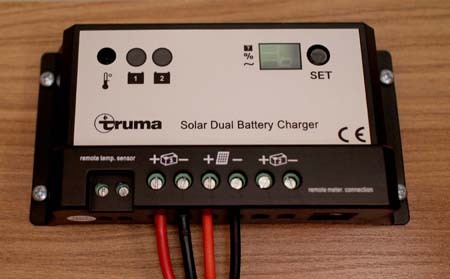 Have noticed there is no Alarm, only a Basic Tracker retrieve, which only last 5 years, on a van of this price you would expect tracker caravan monitor, which we had on the virgina, especially when the s3 as a solar panel for power, does having no intruder alarm affect the insurance premium..
We can’t speak for other insurance providers, but in our case we do offer a number of different safety and security discounts. We provide a 5% saving for customers who have an alarm fitted as we recognise they help tackle and reduce theft. It’s actually not very common to find standard fit alarms on 2015 models, but by having a TRACKER retrieve fitted you can enjoy other discounts – you’re automatically eligible for a 15% insurance saving with Caravan Guard. We bought the 2014 Cartagena in April so it was disappointing to find the Mark 3 coming out so soon, we part exchanged a 14 month old Swift & would never go back there, this is our third Bailey. The only niggles we have are about the sink having no worktop at the side so it splashes & in the bathroom the small gap between sink & shower door prevents easy cleaning however the work space in the kitchen is far bigger than any van we have owned & the interior is bright & very comfortable, we love it. Great to hear feedback from a current Unicorn owner. Glad you’re liking your Cartenga apart from those minor niggles. As an owner of a 2011 Unicorn Seville we were disappointed with Unicorn2 (silly round sink position – loss of locker space with panoramic window).The new model has addressed the sink problem but loss of large shower and lockers in not an improvement simply a weight loss trick.Bailey losing ground to Swifts in my opinion. I cannot say that I have taken to these new Unicorns. We brought a Pegasus in 2012. The main reason was the large rear bathroom with a large rectangular shower tray. We stood in the units with the round shower trays and we soon found out that they are just not big enough. We are not very large people,either. As we use our unit mostly in fields and with just ‘van running on gas and battery (backed up by solar panel). So even though these look nice I’m not sure they are practical enough for our use. We own a 2012 Pamplona and see little here that would entice us into exchanging it for the latest incarnation. Why have Bailey not included an end double bed model? The transverse bed just doesn’t work for us and as we use sites with good quality sanitation large rear bathrooms are,to our mind, a waste of space! The new Unicorn range looks fantastic- especially the tower fridge. We would have changed from our current caravan to a Unicorn ages ago if only the shower cubicle were larger! The round cubicle takes up room which could be better utilised if it were rectangular. So we will wait for the shower to be changed. Otherwise it’s a great van. Some great feedback on the Unicorn range, keep it coming! Irene shame the shower’s not hitting the spot for you. Enjoy the new ‘van Alan! We picked up our new S3 Valaencia on 4th sept 2014 and left for Spain on the 7th, the van towed well behind our audi q3 with no issues what did stand out is the new fridge freezer 35c temp in spain and the ice cream stayed frozen, we arrived home early nov, we had a few minor warranty items fixed got to febuary 21st loaded up and off again to spain, we purchased a trye pal through our dealer cosford caravans, this is an amazing piece of kit it constably monitors the van tyres on the move, cold pressures are 60 psi and running pressures are around 70 psi buy one it made us comfident, today 1st march 2015 we have made good use of the van and love it our first van for 17 years WHAT A GOOD BUY by the way we are in shorts and t shirts and its 23 deg on the costa blanca. on the journey down through fra nce we stopped a abbyville overnight and expierienced a bitterley cold night but we did know until we woke up next morning the aldi worked really well,we have owned 8 autotrail motorhomes costing between 45k and 75k this bailey at 21k is a better buy. Hi Alan, thanks for sharing your story. It’s great to hear that you’re happy with your Bailey. Clothing is at a minimum at rear cupboards and wardrobe. I have a bailey seville 2011 model and I am very pleased with it.But have no intention of buying the new model as I do not like the large front window as you loose the cupboard space which I love, also in the bright sunlight you are not suppose to shut the blinds down fully as there is supposed to be a risk of fire. Hi we are interested in buying a new twin axle bailey,I have one to part ex it is a 2007 bailey Wyoming emaculate condition full service history from dealer,body protection has been done showroom condition,what would mine be worth against a new twin axle,any information would be welcomed,regards jimmy pinnington. Best advice would be to discuss part ex values with your nearest Bailey dealer. You could do that using the Bailey caravan website’s retailer locator. It sounds like you have kept your existing Bailey in superb condition so that should be taken into account when trading in. Perhaps you’d be best to take your ‘van to the dealership so they can see the condition first hand. The easiest thing to do is to check the price of other 2007 Bailey Wyoming on Autotrader. I ran a search using our postcode and found the 2007 Wyoming going for between £8,350 and £9,995, (see here for details) I guess if yours is in a good condition you would be looking at the top end of this range. Absolutely gutted that I’ve just bought an S2 and the S3 has arrived. I’m sure the Series 2 is still a cracking caravan Kevin. 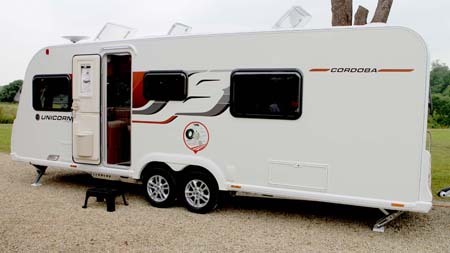 The new Unicorn range looks a lot better than the outgoing model but it still looks like it has too many “add on panels” that if like its predecessor will trap dirt and make the caravan hard to clean. The Alu Tec system is great but does not have the clean lines of other manufacturers. Hoora for a twin axle twin bed model. Ref: new unicorn, they have done away with the front side external lockers, these are / were useful for such items as: Levelling blocks, chemical, waste pipes, waste container, fire bucket, jack, jack handle, plus a lot more of out door items. So question is where do you now store / carry these items. We have a 2013 unicorn valencia a lovely van but still got unresolved problems, just hope the build quality is better on the new models.